What Is The REAL Health Status Of Homeowner Mortgages And Our Economy? Generally speaking, the consensus seems is that the residential real estate market in most parts of the country is on the upswing in the aggregate. As a licensed Realtor, I will run with that consensus as much as I can because so much of our economic health is psychological and relies on consumer perception. Anecdotal evidence indicates that there is an impressive correlation between the tone of the national headlines about the economy and the psyche of the average consumer. If the news anchors say the sky is falling everyone will soon be running for shelter, even if there is no empirical evidence to support the claim. Similarly, if national headlines are droning on about the lousy economy, high unemployment, and soon-to-be-rising interest rates, home-buying will grind to a virtual stand-still. What both of these occurrences have in common is that they frequently rely on inconclusive, or superficial, data that do not adequately represent the economic “status-quo”. For example, below is a graphical representation of actual data from Core Logic, an aggregator of real estate data (among other things). The old saying goes: “The only difference between a recession and a depression is that in a recession your neighbor is out of work, in a depression YOU are out of work” So what does this mean? 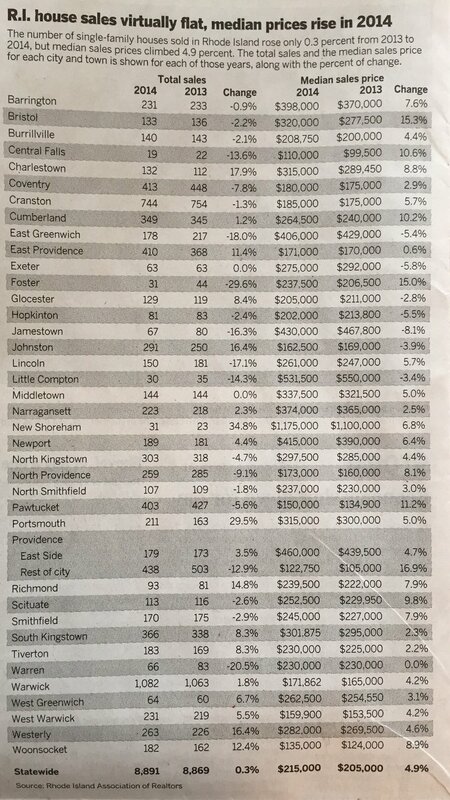 Selfishly speaking, I don’t know and as long as houses are selling in RI and MA (which they are) I am not sure if I should be concerned. However, when I read economic data that do not support the economic outlook; in the back of my mind I can hear the voice of one of my college economics professors emphatically stating that the real numbers do not lie…but those numbers can be manipulated by others for political gain. Case in point: http://tiny.cc/ifnutx an article in the NYT trumpeting the great employment outlook, and this sobering report by the CEO of Gallup http://tiny.cc/oknutx. What do you think??? Rhode Island has been hit especially hard since the last downturn because the unemployment rate has been one of the highest in the nation, and it has been ranked last by CNBC on several occasions for business attractiveness. Next I read the predictions for interest rates from several different sources and they all indicated that rates are going up from .3% to 1.2% by the 2015 4Q. So to extrapolate: In a “worst case scenario”, if the price of a house increases from $200,000 to $210,000 AND interest rates increase 1.2% (NAR) the monthly payment excluding taxes and insurance would increase from $948/mo today to $1,143/mo at the end of 2015. That is an extra $2,340/year, $35,100 over 15 years, and a whopping, uncompounded, $70,200 over 30 years. Wouldn’t it be better to have that money in your retirement account, or use it for a vacation home? Since we have been at historic lows for a few years, and prior to the downturn the “Fantastic Rates” were well over 5%, this is not that outlandish. It is also not outlandish to think that we will not be returning to rates this low for generations since prior to 2010 we had never had rates in the 4% range (BankRate.com.) So what do you think is now a good time to buy or sell a home??? If you have questions about buying or selling a home, email Joe@JoeLucaRealEstate.com or voice/text at 401-580-9797. This entry was posted in Entrepreneurial Attitude on February 1, 2015 by Joe Luca, REALTOR.